Get On Board the ORCA Bus! It’s a rainy day in Powell River, but that didn’t stop the ORCA (On the Road with Children’s Activities) Bus from making its rounds. This morning I caught up with them at their scheduled stop at Pacific Point Market to present Elise Statham, our local Success by 6 Coordinator, a cheque for over $1,500 (the concession proceeds from our 2015 Powell River Movie Night). While I was there, a van pulled up and two children tumbled out, laughing as they raced each other to be the first one on the bus. What makes the ORCA Bus so special? Well first, this much-loved vehicle delivers fantastic early childhood programs to areas in our community that may not have access to them otherwise – from Saltery Bay to Lund, and everywhere in between. 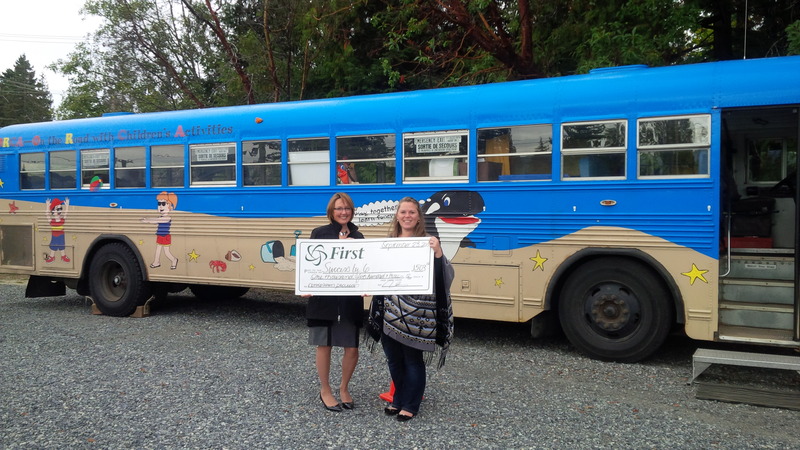 The bus delivers a Strong Start outreach program for SD#47, Family Place programming, Infant Development Programs, and many of other activities with various organizations and businesses in Powell River. But even more than its great programming and unique way of reaching out to everyone in our community, I think what makes it so special is the collaborative spirit that makes the ORCA Bus possible. The bus receives significant support from local volunteers, businesses and organizations – without the volunteer time, without the donations, and without the community partnerships, this bus would not be on the road. It is truly a gift to our community, from our community! What can you do? Check out their schedule to find out when the ORCA Bus will be in your neighbourhood next. Ask Elise how you can get involved. Get on board the ORCA bus! Fantastic!!!! My boys have all LOVED the ORCA bus! I am so proud to be part of a community that shares these amazing programs! Great job Success By Six!! !